Thank you to everyone who attended our whirlwind webcast tour of our latest training guide: Autodesk Advance Steel 2018 Fundamentals. We are excited to add this to our growing list of titles. In the webcast, I gave an overview of how Advance Steel works by walking through several exercises from the training guide including how to create a basic 3D model with columns and beams that are connected using tools in the Connection Manager. From there, I showed how to create 2D drawings from the model using the quick document palettes tools and view these drawings using the Document Manager. If you were not able to attend or want to review the webcast you can visit our ASCENTctk YouTube channel to watch it here: From Model to Drawings Using Advance Steel. What advantages can be obtained compared to Revit Structure? Will Advance Steel be used instead of Revit Structure? I played with Advance Steel connections in Revit. How different is the functionality in Advance Steel vs. Revit? Which software you should use depends on the Level of Development (LOD) to which you are designing. LOD is a standard that states how much information is stored in a BIM Model at different points in the process. 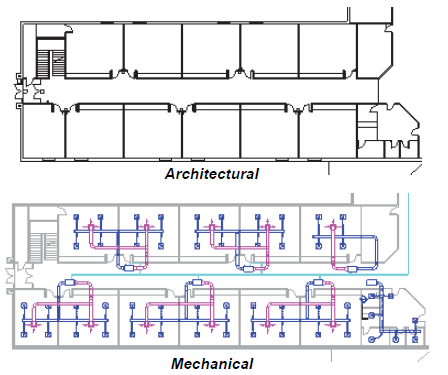 Conceptual design starts at LOD 100 and full fabrication drawings come in at LOD 400. As you can see from the graphic below Revit is not quite as detailed as Advance Steel. Engineers/Designers produce the design models and construction documents in Autodesk Revit. It is important to use Revit so you can work with the architectural model and other disciplines. Steel Detailers and Connection Engineers work in Autodesk Advance Steel to create the fabrication model, shop drawings, and CNC output. If you want to be able to share models between Revit and Advance Steel install the Advance Steel Extension for Revit. You can then export the Revit model to the Steel Markup Language (SMLX) and import it into Advance Steel. You can also synchronize the models using this add-in. Not all elements can be exchanged. Stairs, Ladders, and Railings do not translate between the two products. To produce even more detail within the Revit model you can load Steel Connections for Autodesk Revit. This allows you to add actual connectors rather than default connection element. While this gets you much further along it is still not the full level of development you need for fabrication. It can also be more cumbersome to add the connectors. In Advance Steel the Connection Vault macros edit cutbacks and coping and such that you would need to do individually in Revit. You cannot do the miscellaneous steel elements such as ladders and railings to the same level. The software you use will depend on the Level of Development you need at that time. Revit and Advance Steel are both excellent tools but they do not do exactly the same thing. So, which one you use is up to you. Don’t forget you can watch the webcast again here: From Model to Drawings Using Advance Steel. And be sure to check out our latest training guide: Autodesk Advance Steel 2018 Fundamentals. The default panel for a curtain wall is typically a glazed panel. As you create the curtain grid and refine the wall design, you might want to use other materials for some of the panels. You can select the existing panels and in the Type Selector, select a panel type with the material you want to use. Additionally, the panel type controls the thickness and can define a door or window for the panel. 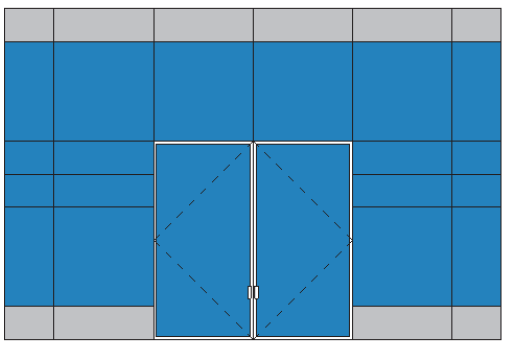 To select all of the panels, select the edge of the curtain wall, right-click, and choose Select Panels on Host. To select a panel, move the cursor over its edge, press <Tab> until it highlights, and then click to select it. This is a short excerpt from the Autodesk Revit 2018: Architecture Fundamentals learning guide. To purchase, visit http://www.ASCENTed.com. Walls in the Autodesk Revit software are more than just two lines on a plan. They are full 3D elements that store detailed information, including height, thickness, and materials. This means they are useful in 2D and 3D views, and also impact material takeoff schedules, as shown below. As with other Autodesk Revit elements, stairs are smart parametric elements. With just a few clicks, you can create stairs of varying heights and designs, complete with railings. 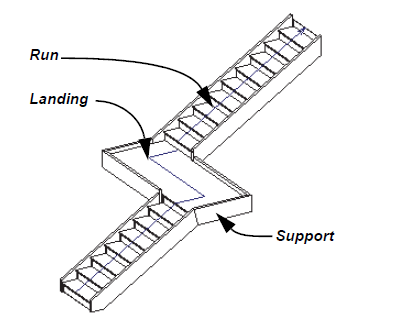 Stairs can be created by assembling stair components, or by sketching a custom layout. Runs: The actual stair tread and riser elements. These include straight runs which can be combined for multi-landing stairs, spiral stairs and L-shaped and U-shaped Winders. Landings: The platform between runs. These are typically created automatically and then modified if required. Supports: The stringer or carriage that structurally holds the stair elements. These can be created automatically or you can pick the edges where you want the different types to go. These can be placed on either side of the stairs or in the center of the stairs. Railings are typically added in the Stair command. They display after you complete the stair. You can select and edit each of the components while you are in edit mode, or after the stair has been created. This is a short excerpt from the Autodesk Revit 2018: Architecture Fundamentals learning guide. To purchase, visit www.ASCENTeStore.com. Views are a powerful tool as they enable you to create multiple versions of a model without having to recreate building elements. For example, you can have views that are specifically used for working on the model, while other views are annotated and used for construction documents. Different disciplines can have different views that show only the features they require, as different views that show only the features they require. Properties of a view are independent of the properties of other views. Many types of elements are added to a project using component families. These can include freestanding components, such as the furniture, floor lamp, and table lamp shown below. They can also include wall, ceiling, floor, roof, face and line-hosted components. 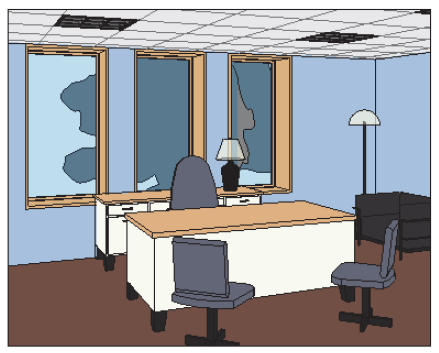 These hosted components must be placed on the referenced element, such as the fluorescent light fixtures. Several components are included in the default template, making them automatically available in new projects. You can load more components into a project or create your own as required.